Wictor earns his money, that’s for sure. He’s lurched at, challenged, and Peter Hook even farted next to him approximately every 90 seconds for 26 minutes. If you think being a music journalist is a piece of cake, kick back in your safe and cozy Laz-y-Boy and chew on this for a while. I read In Cold Sweat sort of because I had to, my brother being one of the subjects, but couldn’t put it down for many reasons. I found the book incredibly fascinating and, at times, not only scary but petrifying. These people walk our earth! Kudos a million times to Thomas Wictor for being brave enough to suffer the slings and arrows of these men and come out not only alive, but a better writer and probably human being for it. A wonderful, chilling, hilarious book! I’m so glad I have one. Although the title looks daft, it turns out to be an excellent premise… [A] dramatic and entertaining read. These no-holds-barred, no-language-censored interviews feature musicians who may have plenty to hide but aren’t inclined to hide anything here… The interviews all begin on notes of indifference, bitterness or open hostility and all go on to reveal experiences in the real world of rock that suggest, but don’t necessarily explain, why these musicians have become what they are today. I can honestly say that I enjoyed reading this book. 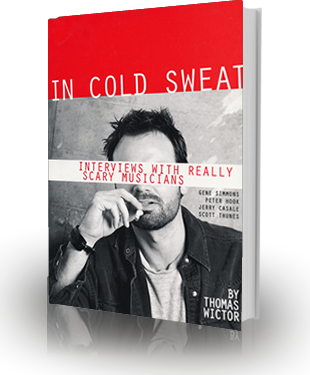 Each of the subjects has had an interesting career and decent insights into music and life. But, I think the ultimate reason I liked this book was because of the very interesting circumstances of the interviews themselves. These people are almost impossible to get a hold of, let alone interview. 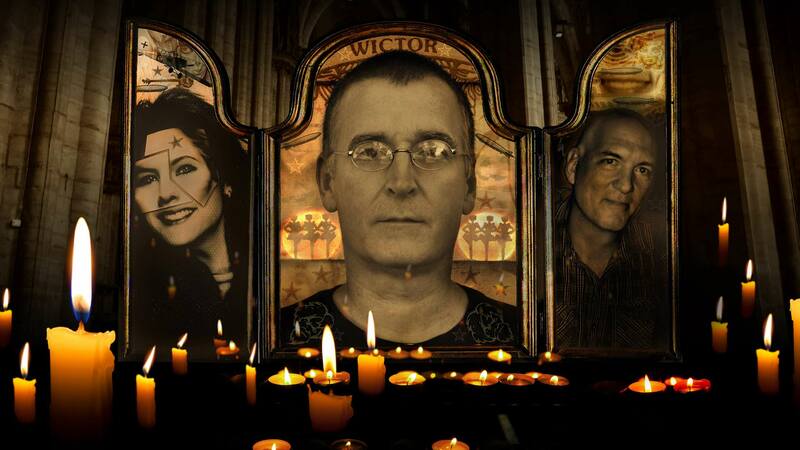 It’s a miracle that Thomas Wictor was able to chat with Kiss’s Gene Simmons, New Order’s Peter Hook, Devo’s Jerry Casale, and Frank Zappa cohort Scott Thunes without getting a little base himself. In Cold Sweat leaves you agreeing with the unagreeable. This book is a tool of oppression. Its author, however, is just a tool. Shameless panderer and lickspittle to the patriarchy, Wictor (how the very name slithers like a viper off the tongue) credits four notably ugly men for various sessions entirely recorded by me during the 1980s in Sherman Oaks, California. Like nausea congealing on a sidewalk, this shameless parade of lies and half-truths reeks of the physical and moral corruption, the squamous squalor, the any-low-meanness-for-a-dollar that defines the present day. I don’t think it’s going too far to say that this book really is everything that’s wrong with the world. If you ever get a jones for the truth, Fauntleroy, man up and interview me. And nota goddam bene–women don’t sweat, they glow.